As it Was! is an interdisciplinary approach to history. Students learn about the people, places, and issues of the world's past through the multicurricular activities in language arts, social studies, science, math, and art or music. 48 pp. each. Each book contains 27 topics grouped into three units, and each topic provides five multicurricular activities. In addition, an introductory activity and an open-ended culminating activity are offered for each of the units. The following are a few of the multicurricular activities: Create Signs Protesting the Intolerable Acts; Calculate the Number of States that Equalled Two-thirds in 1789, 1889, and 1989; Create a Travel Brochure for Salem, MA; and Make a Venn Diagram Comparing the Mississippi and Missouri Rivers. This book is divided into three units: Exploration, Discovery, and Encounter. Among the 27 topics covered are Marco Polo, Magellan, Cabot, Tobacco, Gold, Northwest Passage, James Cook, Pizzaro, and Montezuma. Set 1 in the As It Was! 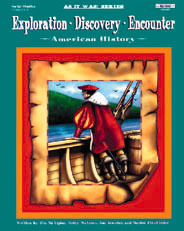 U.S. History series includes the following four books: Exploration, Discovery, Encounter; Settlement and Colonization; War to Constitution; and Westward Expansion. You may also select the entire set.